The host was amazing. Definitly the best host I have had. They went above and beyond, it felt more like a BnB than a hotel. 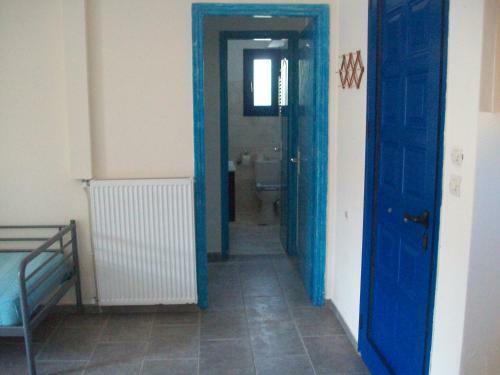 The location is great, less than 5 minute walk to the beach. It was an adequate place to stay but not distinct in any way. Very comfortable room, made me feel like home. Honestly I didn't feel like getting out of the room. The rooms were charming. 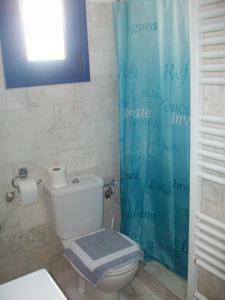 It was so great to have a two bedroom setup with our own bathrooms and to have kitchen facilities. After almost three weeks away, the comforts of home are much appreciated. The patio and deck were great for sitting and enjoying the sunshine. It was an easy walk to the beach and to downtown. But the most important part was the welcome from the owner and staff - we felt like part of the family, offered rides back from downtown and surprise gifts of baked goods in the morning. We would definitely return. Everything needed for our stay was provided. Cleaning & fresh towel & sheets every two days. Collection from & return to port for ferry - even carrying our luggage down steps to/from apartment. Gialos restaurant nearby (10 minutes walk)for wonderful meals. Beautiful, sandy, uncrowded Livadakia beach only 3 minutes walk away. Very friendly owners who were extremely helpful,picking us up and taking us back to the port. Their restaurant was also excellent. Interesting island and good bus service. Incredible hosts, amazing venue, wonderful service! Good location at a distance of a short stroll from the beach, super friendly welcome by the owners and staff (bringing coffee every morning), good size accomodation with all the necessary appliances (airco, fridge, freezer, ...), good service, e.g., cleaning every day, changing sheets every second day. Good location, very spacious apartments with balcony. We loved that our luggage was taken to the port it made our departure a lot easier! 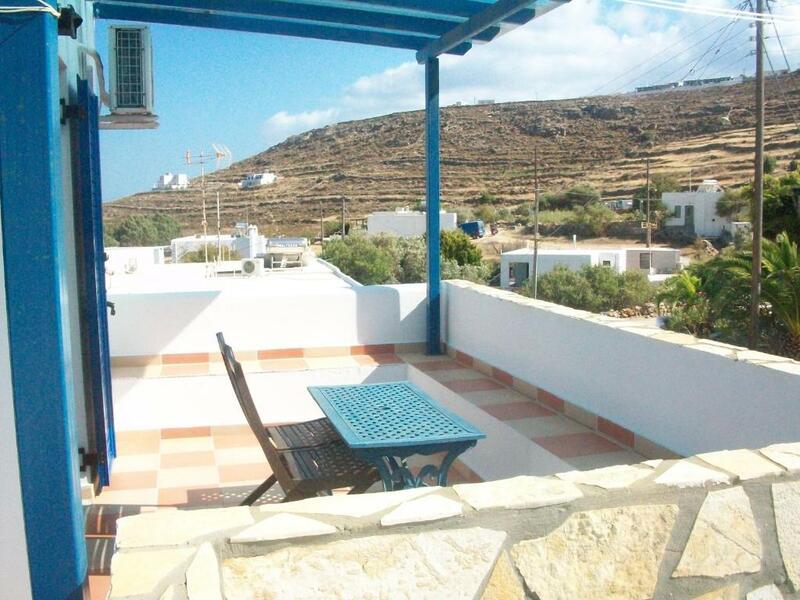 Lock in a great price for Serifos Palace – rated 8.8 by recent guests! 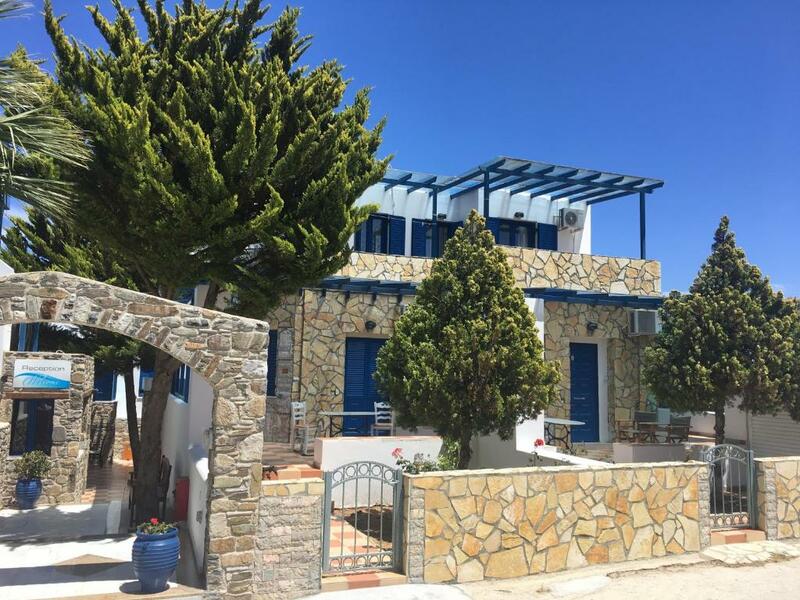 Serifos Palace This rating is a reflection of how the property compares to the industry standard when it comes to price, facilities and services available. It's based on a self-evaluation by the property. Use this rating to help choose your stay! Just 250 feet from Livadakia Beach, the Cycladic-style Serifos Palace features self-catered accommodations and a seafront restaurant. Free transfer from Livadi Port and complimentary Wi-Fi are provided. 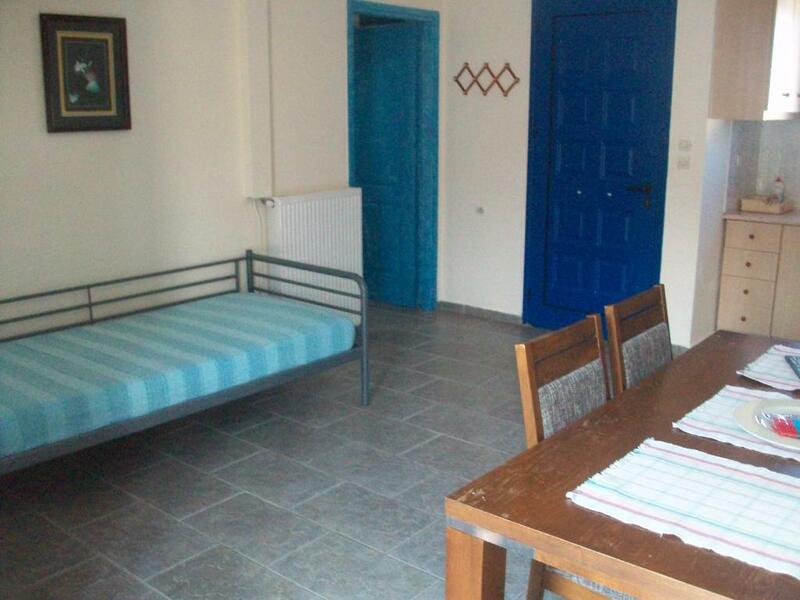 All studios and apartments are spacious and open to 1 or 2 balconies with garden, mountain or Aegean Sea views. Each has a kitchenette or fully equipped kitchen, flat-screen TV and air conditioning. Guests at Serifos Palace can start their day with a breakfast served at the communal courtyard. Greek dishes and fish are prepared at Gialos restaurant, around 1,650 feet away. Serifos Palace lies around 10 minutes’ by car from the scenic town of Serifos with the whitewashed houses and the Castle. The Blue-flag beach of Psili Ammos is 2.5 mi away, while Megalo Livadi village with the mine remaining is a 30-minute drive. When would you like to stay at Serifos Palace? Just 262 feet form the beach, this air-conditioned studio is on the ground floor and opens to a spacious balcony with garden and side sea views. It features a kitchenette, free Wi-Fi and flat-screen TV. Enjoying Aegean Sea view from its balcony, this air-conditioned studio is located on the first floor, just 262 feet form the beach. It features a kitchenette, free Wi-Fi and flat-screen TV. Divided in 2 floors, this spacious apartment consists of 2 bedrooms and 2 bathrooms. It features a fully equipped kitchen and opens to 2 balconies with mountain views. Free Wi-Fi is provided. Divided in 2 floors, this spacious apartment consists of 2 bathrooms and 2 bathrooms on each floor. 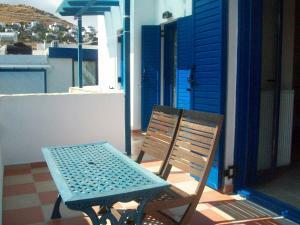 It features a fully equipped kitchen and opens to 2 balconies with garden and Aegean Sea views. Free Wi-Fi is provided. This apartment has a balcony, sofa and kitchen. Welcome! Just 80 metres from Livadakia Beach, the Cycladic-style Serifos Palace features self-catered accommodation and a seafront restaurant. Free transfer from Livadi Port and complimentary Wi-Fi are provided. 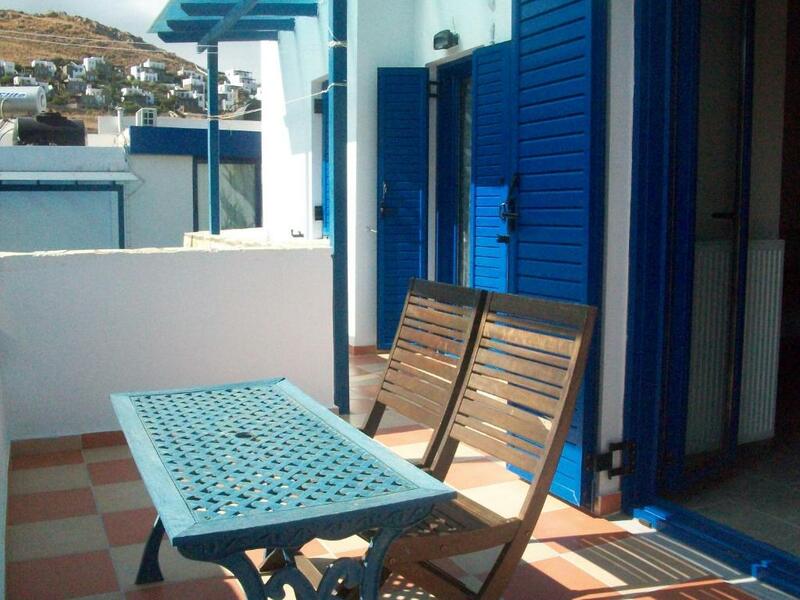 All studios and apartments are spacious and open to 1 or 2 balconies with garden, mountain or Aegean Sea views. Each has a kitchenette or fully equipped kitchen, flat-screen TV and air conditioning. Furthermore, guests at Serifos Palace can start their day with a breakfast served at the communal courtyard or in the privacy of the rooms. Greek dishes and fish are prepared at Gialos restaurant, around 500 metres away. Moreover, at our reastaurant all the customers have 16% discount. The customers that have prepaid their accomodation, they have 20% discount. Finally we offer you dessert for free! Serifos Palace lies around 10 minutes’ by car from the scenic town of Serifos with the whitewashed houses and the Castle. The Blue-flag beach of Psili Ammos is 4 km away, while Megalo Livadi village with the mine remaining is a 30-minute drive. House Rules Serifos Palace takes special requests – add in the next step! Serifos Palace accepts these cards and reserves the right to temporarily hold an amount prior to arrival. Please note that Gialos Restaurant is located in Livadi Port, around 1,650 feet from Serifos Palace. There is a free transfer from/to Livadi Port. Please inform Serifos Palace in advance if you want to use the service. This place charged us twice. Through the website and by cash. We didn't realise this until we checked our account. Contacted the accommodation, they said they would process it but it has been 2months and I've gotten nothing. Booking.com has not helped either as they have not sorted out a resolution. Absolutely garbage, atrocious behavior. The location perspective was misleading (500 meters to restaurants, etc.). If one was without a car, the very steep and busy road to town could be difficult and oppressive in the heat of a Greek summer. Warm welcome and helpful support. It was advertised as having a sea view but the view was disappointing-little sea to see and lots of roof. The apartment could use some general maintenance & up keeping (e.g., missing light bulbs, broken shower handle, dated furniture, ....) but nothing that greatly bothered us. The cleaning crew comes too early in the morning, it would be better to come in the afternoon! No internet in the roomonly reception, but come on, u are here for the sun & the sea, not for FB! The information on booking.com about the size of the apartments could have been better. Now we actually rented more size than we needed. Well equipt apartments, good standard and good cleaning. Easy access to beaches and restaurants. The owners and the staff were extremely helpful and did every thing they could to make our stay pleasant.